There have been some great articles lately on how the cannabis industry is dealing with the lack of clarity from YouTube and Facebook on cannabis content. If you were unaware, YouTube has started what is commonly known as #potpurge and has begun deleting all cannabis content and channels. This includes channels that were just about growing cannabis plants, lighting set ups, medicinal talks about cannabis, and just about everything. Some cannabis content creators had their channels up for over 15 years and had hundreds of thousands of subscribers. 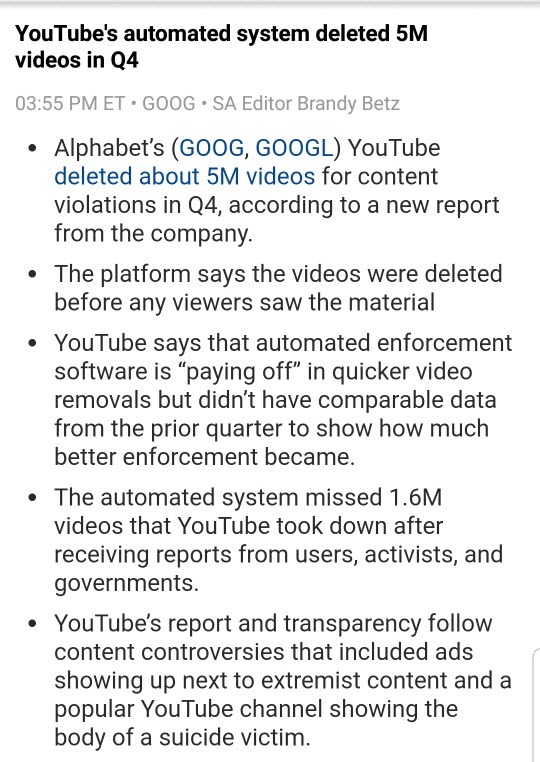 YouTube has given no reason and many of the deletions appear to be done by algorithm or their new AI enhanced moderator tools. How did this all start? Unfortunately, YouTube’s troubles of the past few years or so has an eerie similarity to what Facebook is going through right now, and I can assume we will see the same thing happen over the next 8 to 12 months at Facebook. YouTube, a money-making ad giant for Google, has come under fire over the last year for running ads over very offensive videos, not “cannabis is offensive to conservatives” type videos, but running ads over terrorist recruitment videos, ISIS propaganda videos, and other outlawed content. Big advertisers like Ford and Sony pulled their ads of YouTube for a few weeks to give Google a taste of its own medicine, a Google slap. Google then explained how some billion hours of video content are loaded up to the network each day or week and it was a daunting task trying to manage it all in real time. They promised to hire thousands of new moderators to review suspicious videos, as well as use their AI and machine learning to get offensive videos taken down quicker, and certainly not run ads on them. It appears the marijuana industry has been caught up in the crackdown as just about every cannabis channel and its videos are being terminated. 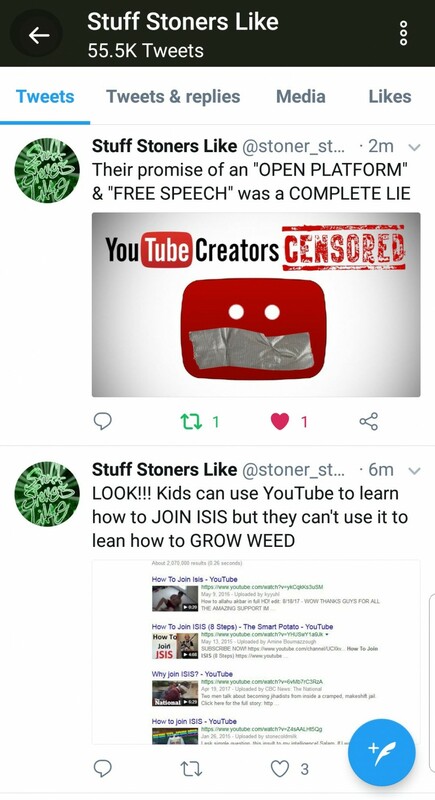 It is very easy for Google to do this on the technical side as all it has to do is do a search for hashtags like #cannabis #marijuana #weed #herb and then just do a line of code along the lines of “if # mentions of these words shows up in more than 5% of all posted videos then suspend the channel and send for human review.” This type of machine learning would allow media outlets doing stories about medical marijuana to stay intact, yet it would signal out the channels devoted to the topic of cannabis. The hardest part for site channel owners is that it is almost impossible to talk or plead your case to anyone at YouTube as all appeals are done on a 500-word character limit. With responses to appeals coming back in only a few minutes in some cases, hence, it appears the computers are doing all the reviewing and closing things down. 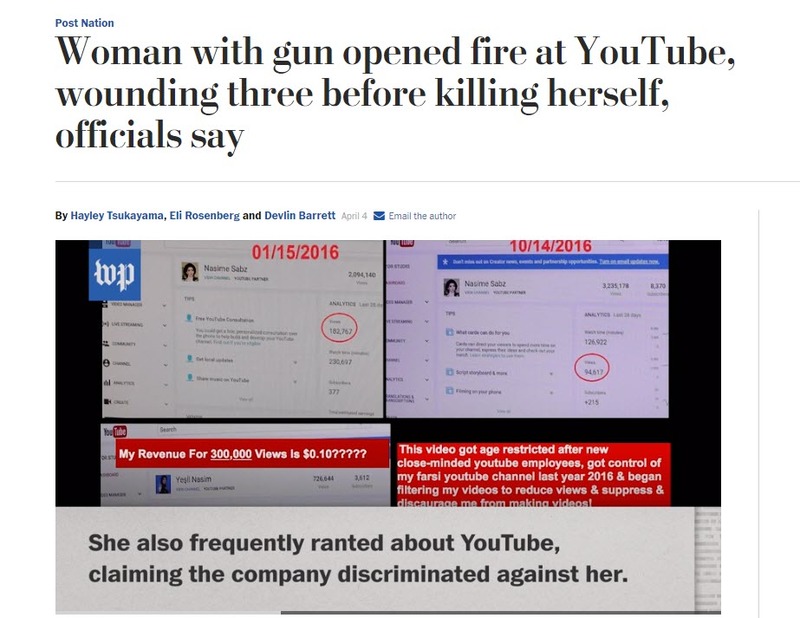 One women this year got so upset at YouTube for age restricting her videos and slowing her revenue down from AdSense that she went to YouTube and started shooting people and then herself. Is it frustrating, you bet. Wait, I thought this was a Facebook article, is this some sort of clickbait?? Bare with me, remember why it was so easy for YouTube to do this, and the first answer to every question, why? Money. YouTube can’t run ads on cannabis-based videos while it is a Federal 1 drug, so hence, Google makes no money on the YouTube Partner’s program or sharing revenue with cannabis channels. To YouTube, these channels were just taking up space on their servers and creating no revenue for them. Facebook has been known for years to not love the subject of cannabis, as they have gone on a few crackdowns over the years where they have shut down cannabis pages. The pages will then re-appear and start to build again. Facebook will not allow sponsored posts or ads from cannabis pages, but for the most part, it has looked the other way as legalization has crept forward year after year. I fear that is about to change. The first domino to fall was that Facebook got roped into the Russian collusion/Trump investigation about Russian ads being shown to US viewers in order to influence their presidential vote. This caused Facebook to turn records over to the government about Russian bot accounts and they issued a statement that included an apology and a statement on how to fix the problem. Mark Zuckerberg, the CEO and founder of Facebook, promised to hire over 5,000 more human reviewers of content and also to drastically slow the appearance of business content in Facebook feeds. People were getting tired of ads and tuning out, so Zuckerberg promised more baby pictures and friends’ posts, less business posts and ads. He told investors that these moves will affect the bottom line for a quarter or two as they hired to correct these lapses. Considering Facebook makes a few billion dollars a quarter, to affect the bottom line is a big job with some ample resources going toward fixing it. That was strike #1. First, you are going to slow business and fan page traffic into people’s feeds. Facebook has been “pay to play” for years now, meaning, in order to get your post or content in front of people, you need to boost it, or pay for Facebook to promote it. This new model will have even less business and fan page posts going into people’s feeds, so now “pay to play” just got amplified, and guess who doesn’t take any money from the cannabis or marijuana industry since it is schedule 1 drug? So even if you did show up with $10,000 a day to promote your cannabis posts, Facebook will not allow it. Basically, like YouTube, Facebook makes no money off the cannabis fan pages and with inventory limited even more, they have no incentive to increase traffic to cannabis pages now. You can see in this chart of a large cannabis sites, by far the largest cannabis Facebook page in the industry at close to 9,800,000 fans, how their numbers shrank with Facebook just starting to close down access and traffic to businesses pages in general. (Please note, these stats are from 3rd party sources like Alexa and SimilarWeb and are only rough estimates for traffic).) These traffic number are shrinking now, and as YouTube accounts get shut down, we say see even bigger drops. The second domino to fall, or strike 2 as I call it, was Facebook getting caught up in the Cambridge Analytics disaster as basically a few data-mining companies were able to download your entire Facebook profile as part of their access to the Facebook API. They only got data, including person stuff, on over 50 million people in the USA, so don’t worry. What could possibly go wrong? That got Zuckerberg hauled before Congress to testify about how this “leak” was handled and how did it happen. This is where things went south for cannabis as well as Rep. David McKinley grilled Zuckerberg on illegal pharmacy ads and illegal drug ads on Facebook. He was able to pull up illegal Canadian pharmacy ads while he questioned Zuckerberg. Does cannabis fall into illegal pharmacy ads and Viagra coming over the border from Canada? No, but once you get going on the “you promote illegal drugs” during sworn testimony, where do you think cannabis is going to end up when Zuckerberg gets back to California and turns his AI bots or the 5,000 new hires he pledged to get started on cleaning up content on Facebook? Facebook has two large blemishes on their recent record, and you can expect them to be on very good or boy scout behavior in order to show Congress and the world they are serious and have cleaned up their act. So now you have Facebook in a similar situation to YouTube in the sense neither could control their data or platform to the point that they could stop malevolent actors. Remember, Facebook has no financial interest in keep cannabis pages around as they create no revenue and take up space in people’s Facebook feeds, when their posts are actually shown to fans. That space could be filled up by a paying customer and Facebook knows that. Two, cannabis is still a schedule 1 drug as of today, like heroin and cocaine. Maybe that changes this year, maybe not, but Facebook need to clean up today and show that they are good corporate citizens, so what is their incentive to keep pages dealing in schedule 1 drug up and running? The fact he specifically got questioned about illegal drugs and illegal pharmacies in his congressional testimony may have been the nail in the coffin for cannabis-based Facebook pages. Remember, Facebook has hundreds of lawyers and lobbyist who have watched his entire testimony and taken notes and studied the questions he was asked. At some point he, or Facebook, will have to return to Congress and tell them what he has done about the privacy and data leak problems, included in that answer will be what steps Facebook has taken to stop “illegal drugs and pharmacy ads”. As of right now, cannabis is on the wrong side of the federal law and it is certainly going to get lumped in with “illegal drugs and pages”. Federal is federal, and state law is state law, and Facebook has no incentive to keep cannabis around while the spot light shines on their platform. Not to mention that Facebook already has a long history of deleting the pages of legal dispensaries in California and edible makers. State license, doesn’t matter, it’s a federal schedule 1 drug. Any cannabis sites with large Facebook pages that are actively posting would be on a Facebook list. Any pages that sell advertising or charge advertisers for naitive ads, or naitve videos, would be on that list. Video views vary by platform, but Facebook considers a video view now at 3 seconds or more for the video to be counted as a “view” or “play”. A Facebook shutdown and YouTube #potpurge would hurt, but would not be a lethal blow to sites that get traffic through Google. The magazine Cannabis Now has 4.1 million likes and great engagement stats. Marijuana World News has 2.7 million likes but does not try to drive much traffic to their actual website. High Times Magazine has over 5 million likes and massive engagement with its’ Facebook audience. World of Cannabis has 1.7 million likes. Cannabis Culture, owned by famed cannabis activist Marc and Jody Emery, has close to 3 million fans and recently had their YouTube channel, PotTV, shut down. The PotTv channel had been online for almost 18 years and it was deleted in 24 hours. No one knows what Facebook will ultimately do regarding cannabis pages. They could just ignore them for now and let them go about their business until legalization is official at the Federal level, or they could crack down and shut down a large number of them as a statement to the government and its user community that it is serious about the cleanup act. The signs are lining up to be very similar to what YouTube went through in the previous year, so be prepared for the worst in the next 6-12 months. Speaking of which, could you like our Facebook page by clicking here, while it is still up. 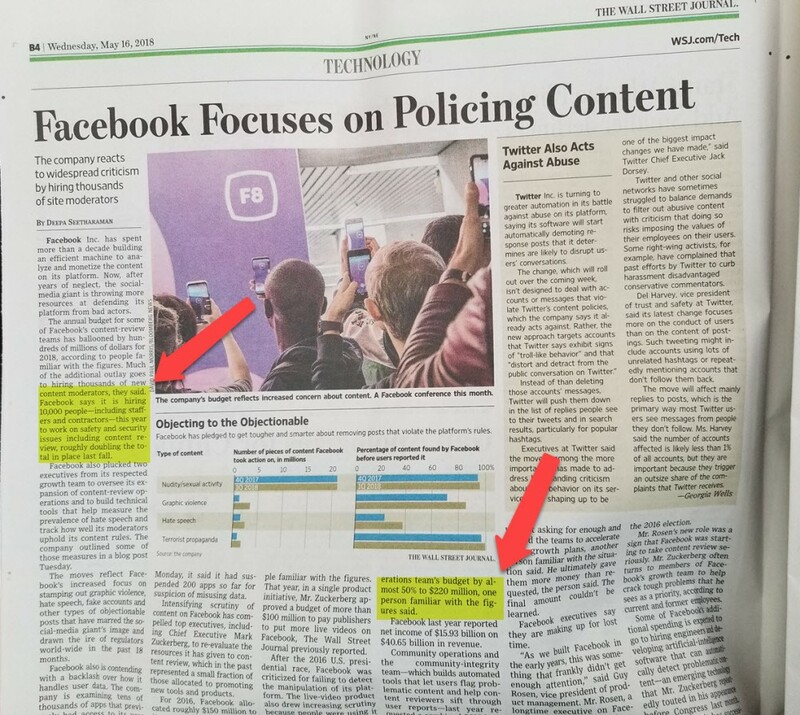 Our opinions are futher validated along our story line as an article in the Wall Street Journal today talks about how Facebook is adding 10,000 more content reviewers to their system staff and doubling the budget for the group to $220,000,000. Does this mean they are going to go after marijuana pages, no. Does it mean there are 10,000 more people looking for posts all day that “violate community standards”, yep. Facebook began what could be the beginning of a major “drug search” overhaul the site. Marjiuana and cannabis based search results were shut down by Facebook. That means that when someone used the Facebook search bar for searches related to pot and marijuana, no results were being shown. All cannabis pages were being blocked from search results, including state government pages and media outlet pages. While the industry guessed it was Facebook cutting down on cannabis, we covered the real reason in a story here. It appears that cannabis caught caught up on a much larger crackdown on the opioids and opiate searches. Many opioid searches would show results with dealers phone numbers and how to order. Since many black market drug dealers who sell opioids also sell cannabis, the pot industry pages got caught up in the sweep. Stay tuned to see if Facebook begins to now close drug related pages, and if so, will cannabis, as a schedule 1 drug, be caught up in the sting?